[INQ. NO. 1709M02] IOREX produces live water as the world’s best no-power water treatment system, which has been developed by IOREX Co., Ltd. IOREX effectively removes and prevents rust and scale by instant ionizing water that passes through a water-supply system. This is the most natural and environmentally friendly water treatment system that also helps living things grow and keeps them healthy by activating water. When water passes the IOREX, static electricity arises due to friction on the contact surface. And when the electrical charge rises by absorbing the static electricity it emits the outer nuclear electrons and becomes charged. Then, a strong static electricity field is created via the transfer of the electrical charge and when water passes through the static electricity field it gets instantly ionized. [INQ. NO. 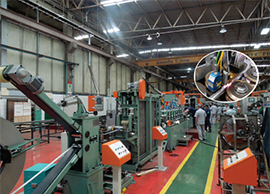 1505M20] Established in 1995, Jeongwoo Coupling has been producing pipe couplings for pipe connection, and pipe repair clamps for pipe repair. The pipe couplings permit easy, safety operations. They enable repeated operations of installation and disassembly, with assurance of savings in cost and time. So, it is called a product that can substitute the welding or the fl ange construction. The pipe couplings show big advantages over competitors manufactured by domestic and foreign makers. They absorb bending and sag (deflection), impact, vibration, and noise. And while slip type of pipe couplings show big performance in absorbing expansion, grip type prevents detubulation. They connect pipes of different material. No treatment of pipe ends is required. It is recommended, in actual use, which just uses a wrench to install. They are secure against fi re due to non- use of fl ammable material, and can save work space because installation is done only on one side. Based on technology innovation, currently around 70 percent of its pipe couplings are exported to more than 40 nations including Japan, England, France, the USA, Singapore, Norway, Sweden, Australia, etc. Domestically, they are also delivered to large sizes of companies such as Samsung, Hyundai, Doosan, LG, SK, with stable supply to small and medium-sized enterprises. [INQ. NO. 1505M30] Ever since its establishment in 1990, KTM Tech has been producing and delivering advanced technology and machinery for quality tube and pipe to customers, which resulted in accumulating of know-how about manufactures of tube, pipe. KTM Tech can supply machinery that ensures highlevel technology, high quality, easy to use, and high productivity, with assurance of decreased manufacturing cost, timely delivery. The long years of experience and faithful observance to customers’ needs made it possible for the company to design machinery suitable for pipe manufacturing line and tube manufacturing. KTM Tech supports the so-called “Turnkey system” and the customized manufacturing , basically with upgrade of the existing equipment and complete after-service. Now it manufactures tube mill, straightening machine, drawing machine, and forming machine. Combining the know-how accumulated for more than 24 years, KTM Tech covers wide range of tube mills – stainless steel tube mill(Ø5mm to Ø216mm), mild steel tube mill(Ø10 to Ø165.2mm), laser tube mill(Ø9.6 to Ø101.6), and titanium tube mill(Ø9.6 to Ø101.6). The straightening machinery is basically manufactured into six roll or ten roll type, with further manufacturing type of 12-roll and 14-roll depending on required precision. And also according to adjustment method of roll’s angle, the straightening machinery is made by dividing into three kinds of a full automatic, semiautomatic, and manual one. A pipe is a hollow-type cylinder that can deliver liquids or gases. It is safe to say that this pipe system has contributed a lot to today’s industry. By flowing liquids like oil from one place to the other, it has benefited and helped many different industrial sectors grow. For reliability and safety, the pipe requires adequate properties for changeable temperatures. And Korea’s pipe maker, Joint Yoochang Thermal Systems, has an answer. Recognizing what the piping system means to today’s modern industry, Joint Yoochang, specialized in providing stable piping engineering systems, started its business in 1994. Since then, the firm has made remarkable progress in finding its place in the industry with multiple awards, quality approvals, and business partnerships. Aiming to beat odds in the piping systems, Youchang offers several different pipe joints : Ball, Slip, Multi, Sink, Ani, etc. Among them, the most common type is Ball Joint that is prepared for thermal changes and earthquake shocks. Yoochang’s Injection P2 Ball Joint approved by the Public Procurement Service in Korea successfully has passed 50,000 times Fluid Cycle Test. Injection TP2 Slip Joint shows efficiency, safety, and reliability when it carries high pressure and temperature steam. Injection CP2 Multi Joint is used for towering buildings where pipes can expand and contract due to stress. If you want more information about ‘Pipe’, please contact us.